Ph.D. in Medicine is a 3 to 5 year full-time Doctoral program in Medicine. The eligibility criteria for the program is holding a post-graduation degree in Medicine or MS/MD degree with a minimum aggregate of 55% marks and above from a recognized university listed under UGC/AIU. The course enables candidates to get an in-depth insight into various areas of medicine strengthening their core skills in conducting research. All the applicants are required to pass the All India Entrance Examination as well as qualify the round of Personal Interview held by the respective colleges, thereafter which the process of admission to Ph.D. in Medicine course will be furthered. In addition, candidates are also required to clear the Pre-Ph.D. course which is for a duration of 6 months and submit their research proposal before the commencement of interview process. Candidates are required to possess an in-depth knowledge of the scientific principles and technologies used in streams of Medicine. Those who have expertise in the different fields of Medical Science as well as possess good analytical and communicative skills are deemed suitable for the course. Applicants showcasing an interest in diverse fields of Medicine including Pharma, Neurology, epidemiology, genetics, etc. can benefit from this course by gaining expansive knowledge into the field. 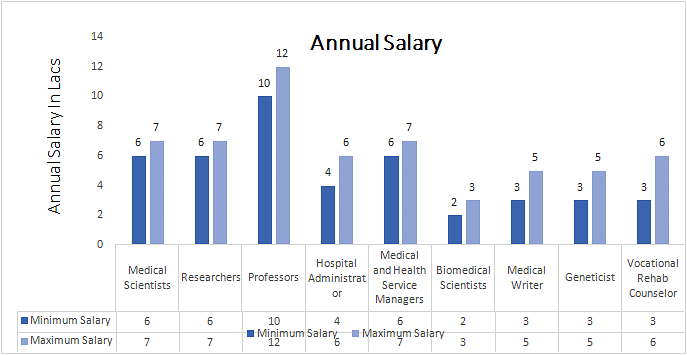 Ph.D. in Medicine program fee ranges in between 30,000 to 2 lakhs which is subject to vary for different institutions and colleges. Doctorates have the benefit to conducting their individual research in their area of specialization. After the successful completion of the program, candidates have opportunities in sectors of Biomedical science, Hospitals, Research and Development sectors, Molecular Pharmacology and so on. The average remuneration earned by freshers ranges from 2 to 10 lakhs, which is subject to increase with experience and differ as per the position. Eligibility MS/MD in Medicine or MSc in the examination with an aggregate of 50% marks or equivalent marks. Admission Merit List, Qualifying the entrance level examination held at state and national level. Top Recruiting Companies Hospitals, Private and Government Hospitals, Research Centres, Academics, etc. Job Positions Medical Writer, Medical Scientist, Geneticist, Biomedical Scientists, etc. Ph.D. in Medicine: What is it About? Ph.D. in Medicine is offered as a combination with Doctorate of Medicine in many medical schools and universities. The program is particularly designed for those who wish to conduct research in Medicines, benefitting the student to gain a broader view of the subject wherein all the major areas of medical science are covered extensively. Candidates gain an understanding of the major areas of the course thus helping them in conducting future research work. The program spans a duration of 3 to 5 years which can differ based on the college of admission. Candidates are required to possess the zeal of learning about medical science, dwelling into areas of expertise, gaining a broader perspective of the subject. It is necessary for candidates to have the background knowledge of the field and about the medical sciences, along with its application in diverse fields of career. Through this program, candidates gain the advantage for polishing their analytical and innovative skills in order to apply it in future research work. Ph.D. in Medicine Syllabus is designed in a manner wherein along with covering all the major criteria, the program gradually progresses into conducting of research, dissertation and compelling the knowledge to build a thesis. The weightage of the marks will be decided as per the college. Ph.D. in Medicine covers all the major areas of medicine including Neurology, epidemiology, genetics as well as various clinical and non-clinical streams. Students have the liberty to choose their area of specialization in the final year after the first two years of classroom study comprising of clinical course-work. The program helps in building the core competencies of students who wish to major their expertise in research and development. Doctorates after the successful completion of the program have the opportunity to begin their career in Hospitals, Research and Development, Pharmacy, Medical Pharmacology, Biomedical industries and other such. The aim of the course is to train the students with required skills of communication, analysis, and competence in order to carry out their research program efficiently. Candidates who have passed their Post graduation degree in either of M.Optometry or M.Sc. in Medical Degree from any recognized university in Physiology, Anatomy, Pharmacology, Microbiology, Biochemistry and so on with a minimum aggregate of 50% marks can also seek admission for the program. Applicants seeking admission to Ph.D. in Medicine course are required to have passed their post-graduation degree in Medicine or in either field of M.Optometry or M.Sc. in Medical Degree with a minimum aggregate of 55% for general category and a 5% relief i.e. 50% marks and above for SC/ST category from a university recognized by the Medical Council of India. Clearing the All India Entrance Examination is a prerequisite for admission to the course. Admissions are done on the basis of merit list, the marks of which are calculated adding the scores obtained in the entrance examination and personal interview. The merit list cut off will be different for different colleges. The application forms for the program will have to be downloaded from the official websites of the college, which can be submitted online or offline attaching along with the documents as mentioned by the university in addition to a NOC from the HOD of the institute. Candidates will have to clear the Pre-Ph.D. course spanning for a duration of 6 months before the actual course begins. The syllabus is divided into a balance of Classroom theory session as well as projects as dealt with the program. Ph.D. in Medicine programs cover subjects specific to the course of Research Methodology, Application in Medicine and much more. The program imbibes in students all the essential skills assisting them in becoming a researcher and conducting thesis at the end of the course. **The syllabus of the course is subject to differ for different institutions and colleges as per the norms set by them. Post the completion of Ph.D. in Medicine, the students are qualified to get a deeper insight into the subject. Throughout the course, candidates gain a major understanding of the subject, and as they are rendered with practical on-field knowledge, this course deems beneficial for the students enabling them good career prospects. They have lucrative opportunities in the segments of Research and Development, Biomedical industries, Scientific study as well as in Government initiated schemes for medical health. They can become researchers, Medical Officers, Hospital CEO and CFO, Hospital Head and other such apart from taking up the profession of lecturers at universities and institutions.